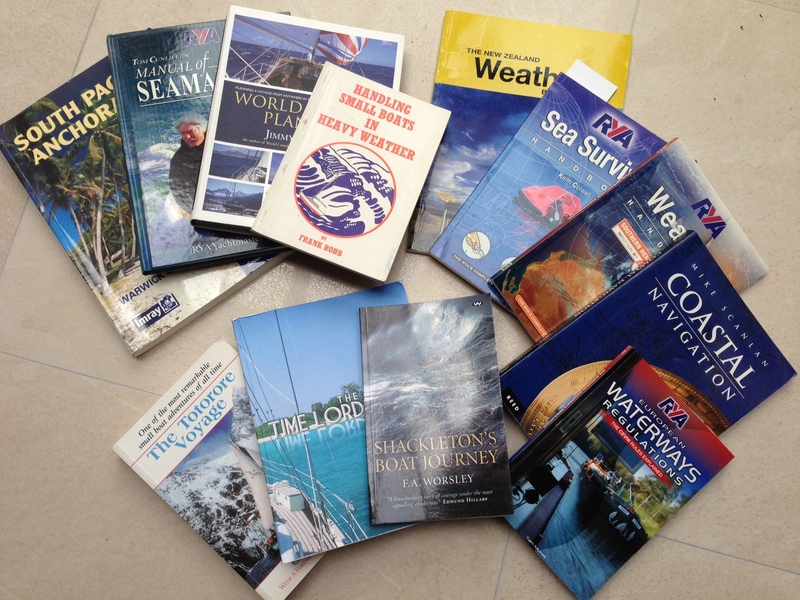 If like me, you can’t yet be out there actually sailing around the world right now, there are plenty of books to help with your sailing plans and assist to build up your sailing knowledge or are just great armchair adventure sailing books to read while curled up somewhere warm and dry. Books are heavy and with limited storage space on board, it can be difficult to find somewhere to stow them. They also don’t like damp conditions. So Andrew very kindly bought me a Kindle! I am now in the process of loading up my Kindle with some old favourites and new books so I have my own electronic library ready to take anywhere on our adventures. I love the Kindle features, it is small enough to keep in a handbag, the light on the display is great for reading during the day or night, you also don’t disturb the person sleeping next to you by having a night on. You can look up word meanings, add bookmarks to pages you want to refer back to, highlight passages or sentences. You can also share books with your friends – lend them out for 14 days to another Kindle user. You can also have a Family Library, where all the books you download can be shared with another adult & up to four children. Another cool Kindle feature is that you can now have unlimited access to all Kindle Books and audio books for USD$9.99 a month. Click here for a free 30 day trial. I haven’t tried them yet, but I imagine that the audio books would be great for night watches, enabling you to keep your eyes on your surroundings but get to read/hear a great book at the same time. In saying that though, I do think that some reference books and text books are better off being in print. This is a brilliant book with some fantastic tips about how and when to plan your route across the various bodies of water around the globe, taking advantage of the prevailing wind and currents. Jimmy notes all the places of interest to visit along the way. He has also written two other books: World Cruising Routes and World Cruising Destinations. These are both on my list of books to read in the future. I am currently studying for my Ocean Yachtmaster qualification, and this is the text book. There are probably hundreds of books written on this topic. This one is full of great tips and advice and diagrams. This book is a fantastic overview of all the South Pacific Islands. There is a wealth of information about local hazards, advice for dealing with tides and currents and the best anchorages depending on the wind. This book came in really handy when we were in New Caledonia. Although being that it covers the whole of the South Pacific, there are probably some places that get left out. This is a great book and one worth re-reading every so often, particularly before a longer voyage. There is advice on different techniques for dealing with storms at sea. This is another text book from a Sea Survival Course I did a few years back. Lots of great tips, especially around getting your grab bag sorted and what to expect if you ditch in to a life raft. Another Ocean Yachtmaster handbook. There are separate books for Northern and Southern Hemispheres. Sailors always have one eye on the weather. This book helps you to learn more about various weather patterns around the world. This was the text book from my Coastal Skipper Course. Packed full of information on the various techniques of planning a coastal passage and obtaining your position. If you are planning on cruising around the European Inland Waterways, then you will need to sit a CEVNI test, and this can be done online via an RYA training provider. This is the book to read before you sit the test. The rules on inland waterways differ significantly from the COLREGS. This is brilliant book and an essential item for any boat library. You often hear people saying that they are going to consult Nigel (the author) before tackling any of the complicated tasks you will find every day on a boat. This book explains simply but in detail how most boat systems work and how to repair them. Jackie Parry has been cruising for many years, and she has collated a wealth of knowledge in this book to share with others embarking on the same path. This is a book for sailors who want to learn about stepping their own masts, inspecting and maintaining their own rigs, and turning their own tailsplices and wire eyesplices. It is for boatowners who want to replace an entire gang of rigging themselves–measuring, choosing appropriate wire, turning soft eyes, leathering, and serving. It is for bluewater voyagers who want to feel secure in the knowledge that, should a shroud carry away far at sea, they will be able to repair it. A brilliant book about all sorts of aspects of living on board or preparing for a long voyage. Great tips on provisioning, recipes, dealing with seasickness, dealing with port officials, the best kind of clothing to wear and so much more! This would have to be one of my all time favourite stories of adventure and survival. Worsley is a brilliant writer and you feel as though you are in the tiny boat crossing the Southern Ocean in a frozen reindeer sleeping bag with the rest of the crew. You just have to read this book! A classic for every sailor, Slocum was the first person to sail single handed around the world, and his book describes his adventures along the way. I am a big fan of Captain Cook and here in New Zealand many places were named by him. This book is the best book I have read about Cook, and I have also just downloaded it to the kindle as well. Mundle brings the history to life, it is easy to read and a fascinating account of this amazing man. After having read Cook, I was keen for more of Rob Mundle’s work, so I next read Bligh. Again I learnt so much about this man, the mutiny on the Bounty and his amazing account of survival in a small boat across a huge ocean. Mundle has written lots of seafaring stories and I am going to have great pleasure in reading the rest of his books. A gruesome story set in the 1600’s. A ship sailing from Amsterdam to the Dutch East Indies is wrecked off the coast of Australia. The survivors are quickly overcome by a vicious mutineer. Difficult to read but an incredible piece of history. A father and son set sail from Tasmania to Antarctica and the windiest place on earth. They meet a few unexpected people along their adventures south too. Ever thought about sailing a mirror dinghy down the Thames? Then how about across the English Channel and through Europe to the Black Sea? A wonderful story of adventures in a tiny boat. I loved the descriptions of the people he met along the way. Liz Clark describes her love of sailing and surfing, her adventures, highlights and difficulties of being a solo woman out on the water. A fantastic story of finding a connection and understanding life. A wonderful story of a sailing adventure around the Caribbean. Vivid characters and recipes of the foods they eat along the way. When a sailing novice who suffers from panic attacks sails across the Pacific – what could possibly go wrong? A love story with a young couple setting off to deliver a yacht across the Pacific, but they end up caught in a huge cyclones in the Pacific. The story has recently been made in to a movie, but the book is well worth a read. A couple in their 30’s quit their jobs and set sail from Sydney. Read about their adventures in South East Asia. A lighthearted tale of a reluctant sailor and her adventurous boyfriend. I found myself relating to the boyfriend more than the main character. However it is a nice easy reading account of her time at sea and overcoming fears. A humorous story of a couple who sold up and moved aboard, the things that went right and the bits that didn’t. Hilarious observations from a man who lives aboard. This is a fantastic story of how a young grieving office worker ran away and ended up sailing around the world. Jackie has had some amazing adventures. This is a great book. I was lucky enough to meet Laura Dekker at her book launch here in Christchurch. It is incredible what a girl so young achieved against all the odds. Her story is inspiring to me (and many others I’m sure) – if she can sail around the world alone, then surely I can do it with Andrew! Another inspiring teenager with a dream. This is another great book describing how she managed to overcome all obstacles and sail around the world. Matt is a friend of mine, and I absolutely loved reading his book about his adventures in the Southern Ocean. Each chapter is a different adventure, giving you a real feel for this wild and almost untouched part of the planet. Brilliant. A coming of age book about an incredibly strong girl who has a difficult upbringing with her father and sisters on board their boat in the Pacific. I am a big fan of Jackie – her writing style is so easy to read, and her descriptions of the places they visit takes you along on the adventures with her and Noel. This time on their boat Pyewacket. Well worth a read. Andrew Fagan is a bit of a Kiwi Icon. Famous in the 1980’s as the lead singer in the band the Mockers, Andrew is now a DJ on a radio station. He came along and spoke at a Little Ship Club gathering recently about his adventures in his tiny 5m boat Swirly World, which he sailed right down to the Auckland Islands in the Southern Ocean. His writing style and sense of humour keeps you enthralled throughout. Another great book! John follows my blog and started writing to me a couple of years ago now. He has a fascinating tale of survival in his upturned trimaran for 119 days off the coast of New Zealand before they were eventually washed back ashore. This was a controversial story at the time as people didn’t believe that they could have survived for so long. John is a true adventurer and his story of survival is fascinating. A fantastic story of the fun that John Glennie had sailing around the South Pacific, and all the lovely ladies he met along the way. I loved this book. Not exactly about sailing, but a story that many seafarers could relate to. In the 1950’s Tom Neale set off to live alone on the remote atoll of Suwarrow in the middle of the South Pacific. He didn’t see another human for many months, just the occasional passing boat. It is a great read, and somewhere I would like to visit should we get the opportunity while sailing in that part of the world. Imagine falling overboard at night in a storm and seeing the boat disappear off in to the distance with no one realising you are missing. An incredible story of survival. Another great story of the Pacific. A collection of short stories. The author lived in the Islands for many years project managing various infrastructure builds. His book is an account of some of the fascinating cultural and historical stories of the area. Including some mysterious Pirate gold discoveries! Peter Montgomery is another kiwi icon, and yachting commentator. His most famous line would be “The Americas Cup is now New Zealand’s Cup” I don’t know how many times I have heard that line. His story is a behind the scenes account of the America’s Cup and I learnt a lot about some of the dirty tactics deployed along the way! Not exactly a sailing story but this true story features a boat called the Brigadoon which was used by this extremely successful drug trafficking enterprise back in the 80’s. The boat is now owned by some friends of mine! A zombie apocalypse sailing thriller. Not my usual genre of book, but I couldn’t put these books down until I had read the whole thing. Mollie McGhie, a reluctant quirky boat owner who manages to solve the mystery of who is killing off her fellow marina residents. I couldn’t put this book down! Terrifying thriller set on a yacht in Antarctic waters. Part fact, part fiction – who’d know how much is or isn’t true, but all of Tristan Jones’ books about his adventures with his three legged dog. He has written a number of books and they are all great. Pirate treasure in Panama! I loved the way this book jumped from the past to the present tense. The sailors have to unravel the mystery and keep ahead of the cartel who are hot on their heels. A great story about a female captain of a trading ship, set in the 1820’s. I love the way a strong female character dominates in an era when someone in her position would have been quite unusual. A great twist in the plot too. Kept me turning the pages. A novel written by iconic sailor Jessica Watson, a story of a teenage girl who buys herself a boat, meets a mysterious man and uncovers some interesting local history. Great stories of a family of three children and the adventures they have on their boats around Australia and New Zealand with their parents, and friends. What are your favourite sailing books? Please put them in the comments below so I can add them to my kindle collection! I loved Tania Aebi’s “Maiden Voyage”, well written and interesting. Probably the best book of the kind (an account of solo sailing around the world). Apart from that, I read more books about racing than about cruising… to go faster! Thanks for reading our book You Gotta Go To Know and including it in your list! Fair winds! Great book! I really enjoyed it! I’ll have to look for the books on Cook and Bligh – sound great! I am sure you would really enjoy them. Mundle is a great author and I’ve just read ‘Flinders’ as well who was first to map the coastline of Australia. Brilliant book as well. Thanks for this! Matthew Flinders has always fascinated me for some reason – I have copies of his journals, but it’d be fun to read Mundle’s book. Added to the Amazon wishlist!